Tom Rysinski/Pahrump Valley Times Anthony Matassa of Pahrump shows off the form that allowed him to bowl perfect games March 15-16 at the Pahrump Nugget Bowling Center. Tom Rysinski/Pahrump Valley Times Pahrump resident Anthony Matassa shows off the tattoo marking his first 300 game, which he rolled Jan. 20, 2002, his mother's birthday, when he was 16 years old. Tom Rysinski/Pahrump Valley Times Anthony Matassa, who now has six 300 games, on March 22 at the Pahrump Nugget Bowling Center. 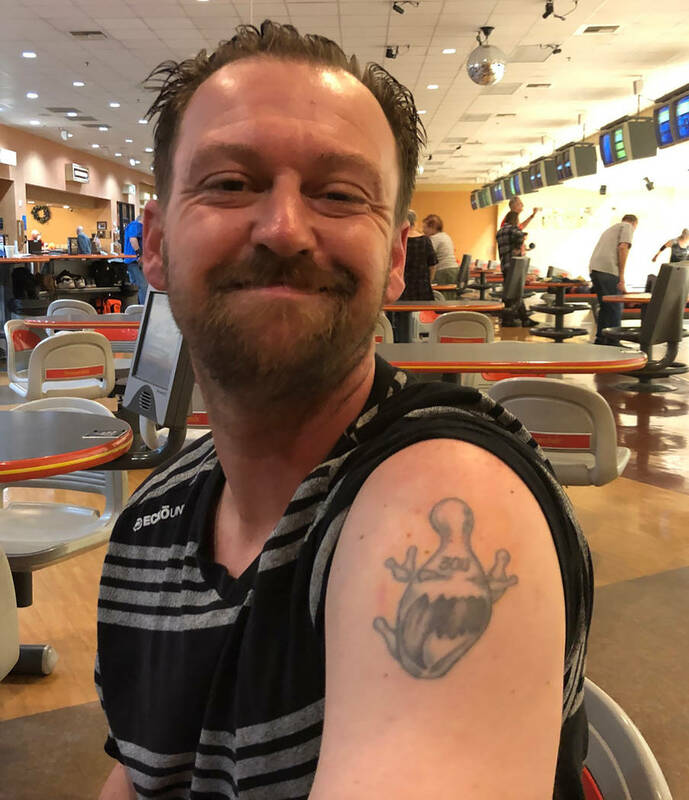 He has just bowled his fifth perfect 300 game the night before at the Pahrump Nugget and was spending the day with his kids at his nephew’s third birthday party. Afterward he headed back to Pahrump to bowl in the Saturday Night Rollers League. And then he went out and bowled another perfect game. The 300s on back-to-back nights would be special for anybody, but for Matassa combining family time with a second perfect game made it even better. Joe Matassa got a very good look at the first of his son’s weekend 300s. “In the Friday night league, when I shot that 300, I was bowling against my dad,” Matassa said. “He was on the other team. Matassa, who lived in Las Vegas for a while before returning to Pahrump, is averaging 223 in his Thursday night league and 226 in his Saturday night league. His appearance in the TGIF League was as a substitute. “On Friday night I was subbing for the team, and after the 300 they made me a regular,” Matassa said. “I came in and shot 193 my first game, and then my second game I shot 247. I left two 10-pins, picked them up and adjusted for the 10-pins, and in my last game I shot 300. He remembers the date of first one very well, happening as it did on his mother’s birthday, January 20, in 2002, when he was 16 years old. At the time, his mother had just moved from Pahrump to Indiana and he had just moved from Pahrump to Las Vegas. Matassa marked the occasion with a tattoo on his upper left arm, and he said family was a big help this time around. “I thank my dad and I thank my kids, because if I didn’t have them I wouldn’t have been so enthused and so relaxed coming to the bowling game,” he said. He also thanked Track Bowling, as he used his Track 919C, which is a retired model, in both of his perfect games. Matassa even gets his kids, Anthony, 13, and Hailey, 11, to the bowling alley on occasion. Not surprisingly, Matassa remembers the details of each perfect game. “On my 11th shot, I got so nervous,” he said of Friday’s 300. “I hit the pocket so good and I left up the 9-pin, and here comes this pin bouncing off the wall and knocks it down. I turn around, and my dad’s not even looking. Matassa took a different path to perfection Saturday night. “I called my team and said I would be late for the first game,” he recalled. “I come in, get all my equipment ready, didn’t have any practice, no nothing. Shoot 195 my first game. I left six 10-pins, missed one. I adjusted for the 10-pin, made a little bit of hand movement, and I go all the way to the ninth frame. For someone who now has six perfect games, Matassa has never experienced the agony of coming within one ball of 300. 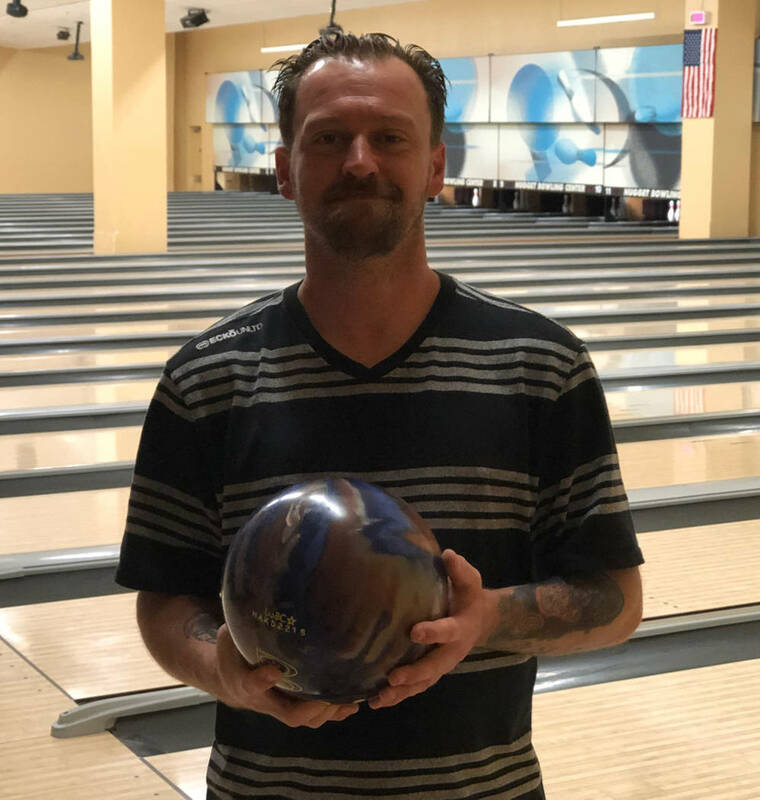 Matassa, who graduated from Clark High School after one year at Pahrump Valley High School, has been in a good place since moving back to Pahrump, as has his father, who is bowling to a 202 average at age 68 and has bowled a perfect game. And Joe Matassa will be spending some very special time with his son in May, at the United States Bowling Congress Open Championships at the South Point Bowling Plaza in Las Vegas. “This year, me and my dad are bowling nationals together for the first time,” Anthony Matassa said. “We get to bowl the team event together, and then we get to bowl the doubles and singles. 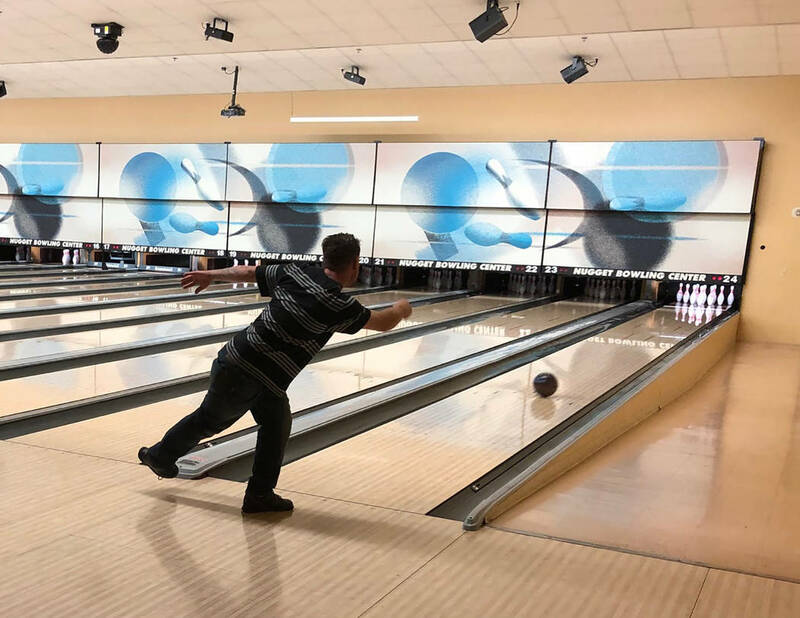 The Pahrump Nugget Bowling Center will be launching summer bowling leagues, with leagues starting on various dates between April 5 and June 5. There will be leagues for men, women, seniors and kids, with leagues running six days each week at various times. First to get underway will be the Beat Your Own Average League, which will bowl at 10:30 a.m. Fridays. The meeting date for that league, which features singles bowling in groups, is 10 a.m. April 5. For more information on Beat Your Own Average or any of the other leagues, call the bowling center at 775-751-6525.